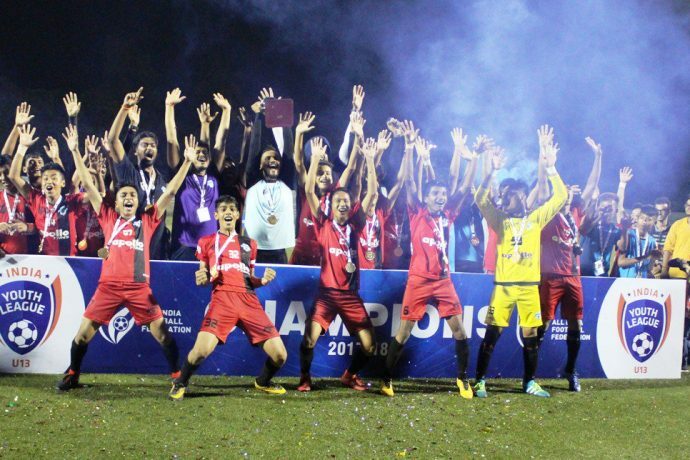 Minerva Punjab FC eased past Mohammedan Sporting Club 3-0 in the final to triumph the inaugural U-13 Youth League at the Barasat Stadium yesterday. Mohammedan SC more than played their part in an entertaining final, but it was Minerva Punjab’s energy that would light up the occasion and provide a thrilling end to a thoroughly entertaining tournament. Minerva Punjab who lead 1-0 at the interval scored through Longjam Swami Singh (3rd minute) and Himanshu Jangra (45th and 46th minute) at the Vidyasagar Stadium in Barasat, Kolkata. Although Minerva Punjab went into the game as hot-favourites, Mohammedan Sporting began the game in attacking mode and could have taken the lead in the first minute itself. Skipper Sujay Budhuk did well to cut in past a couple of defenders from the left but his powerful drive sailed inches over the horizontal. While the Young Panthers pressed high up, Minerva Punjab managed to take the lead against the run of the play at the other end. Winger Swami Singh capitalized on an error by Mohammedan SC custodian Sakirul Islam from a header to put his team ahead. Having conceded early on, Mohammedan SC began attacking with intensity through Mohammed Zeedan, Nabakumar Santra and Sujay, but Minerva Punjab showed character to hold on and at the same time also managed to create chances of their own only to miss with their strikers Tongbram Maheron Singh and Himanshu, as the first half ended 1-0. The second half was a similar story as Mohammedan SC dominated the majority of the proceedings looking for the equalizer and almost camped in the rival half. Mohammedan SC looked to catch Minerva Punjab on the counter-attack, but poor finishing proved to be their downfall as they wasted a number of good opportunities to level the scoreline. However, Minerva Punjab ended Mohammedan SC’s hopes of a comeback with back-to-back goals through their skipper Himanshu in the 45th and 46th minute respectively. Meanwhile, Mohammedan SC at the other end had their best chance of the game when Sujay slid in a teasing low ball for Tapan Soren, who just managed to direct an effort on target, but Minerva Punjab keeper Charles Tongbram had come quickly off his line to make a brave block in the 64th minute. Minerva Punjab had a golden chance to go further up in the 68th minute when Maheron found himself in space inside the area but his first touch let him down and the opportunity slipped by because of poor technique. In the additional time, Mohammedan Sporting went all out for some late goals but Minerva Punjab did well to protect their gains as the match ended 3-0 with Minerva Punjab clinching the title.